My[Arthvader] preview for The King of Fighters XIII. An in-depth look at the most important reasons why Arthvader is hype for KOF13. The story takes place after the event's of KoF XI. Ash Crimson has just recently managed to claim two of the three power held by the decedents of those who sealed the Orochi 1,800 years ago (Chizuru Kagura and Iori Yagami), while leaving Kyo Kusanagai to be his final victim. As Elisabeth Blanctorche, a former comrade of Ash, prepares to stop him, fighters from around the world received a letter with an invitation to another King of Fighters tournament tournament, in which it's be hosted by a person being simply labeled as "R". This person is Rose, the sponsor of the tournament, who is currently being controlled by "Those from the Past", the organization behind the two previously held tournaments that has been trying to break the seal of the Orochi. Let's talk modes first. The game will have the following modes: Story, Practice, Challenge, Customize, Tutorial, Replay, Gallery, and Online. In the Story mode, you can view events from the perspective of multiple characters, and it will be influenced by the decisions you make, as well as your battle results. when it comes to battling the CPU in the story mode, you'll be given random objectives, or Target Actions, which when completed, will give you bonus points, as well as some bonuses for the next round. Also, pre-battle dialog will be shown during the single player mode. With the Tutorial mode, newcomers will be able to learn the basics of the game. the tournament sponsor Rose will explain the basic controls of each character, as well as the importance of each gauge. The Challenge mode will consist of three modes within itself: Survival, where you fight for as long as you can, Time Attack, Where you pretty much just play through the game for the fastest time, and Trial, which you perform various combos with each character. The Replay mode is where you can view replays of matches you saved after battles. I don't know yet if you can watch replays with friends yet. The Gallery is, well, it's self explanatory. in this mode, you can view various pieces of art done by the staff. Another neat feature for this game is the fact that you can customize the character's colors to whatever you want. Sure, at first, there won't be as many colors available at first, but as you keep playing the game, more colors will be available, allowing for unlimited customizations. the best part is, you can use those customizations in online play. 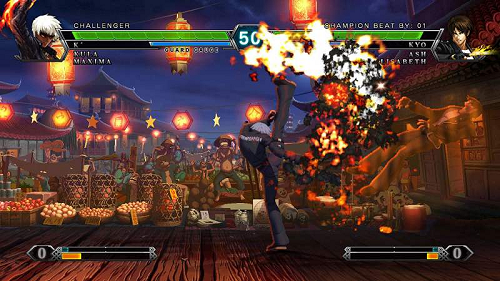 The EX Mode: Players will be able to use powerful version if their moves for the cost of one meter for EX Desperation Moves, and two meters for EX Super Desperation Moves. The Triple Cancel: this mechanic allows players to unlimitedly cancel their character's moves. the Triple Cancel is dependent on the Hyper Drive Gauge. The Hyper Drive Gauge: A three-tier gauge which will gradually drain as player cancel the moves. Whenever the the gauge reaches the max, the player will then go into a state called "Hyper Drive Mode" in which players will be able to cancel unlimitedly for a short amount of time. Neo Max Desperation Move: whenever the player is in the "Hyper Drive Mode" while having at least three power stocks, they'll be able to pull off this powerful technique. Players can also link this move into a combo, in which you'll do a "Max Cancel". Even though the game won't be out just yet, I'd say BUY IT!!!!! Also, pre-order this game to get a special 4-disk set consisting of KoF music spanning the whole franchise. Leave your comments on the bottom, and don't be a jimmy!!! GET HYPED!!!!!!!!!!! Please log on to comment.